The prevalent belief that obtained among laymen and even physicians of this country, was that homoeopathy was not efficacious in cuts, bruises, boils, abscess pain relief, carbuncles, gangrenes, and the like ailments. They were supposed to belong to the domain of the surgeons.Fortunately for suffering humanity such notions no longer exist; experience having resulted in knowledge and knowledge in the inculcation of wisdom, there has been a thorough disillusionment of all such false conceptions and the Materia Medica of the homoeopath has, to a great extent, superseded the scalpel or the surgical blade of the surgeon. It has happened time and again that when the regulars were contemplating an amputation, the distracted patient escaped and saved himself from mutilation and amputation claims by the administration of a timely and appropriate dose of homoeopathic medicine. Hepar sulphuris has helped much in the transformation of the erroneous belief.It is the surgeon among our homoeopathic remedies.The most important feature of this remedy is to be found in its sensitiveness. It runs through the entire rubric of Hepar sulphuris.(image). Hepar is one of the important pain management medication.The pain which another will not mind at all will drive this patient to the border of despair. He can hardly bear the slightest touch. When by accident somebody touches the affected part, which the patient is ever careful to guard against, he may even faint.(image). Hep. sulph.gives excellent results in boils and abscesses when this over-sensitiveness is present.We meet with a similar sensitiveness to touch in Cinchona, Arnica, Ruta, Kali carb., Spig. and a few other remedies.In every one of these remedies we notice great fear of being hurt. In Cinch off, we have a patient with agonising pain, holding up his hands in appeal, to any one approaching him. The Ruta patient starts from sleep with a scream when touched, ever so lightly. So also is Kali carb. Spigelia is afraid of pointed things. While in Asaf. and Sanguinaria we have pain that vanishes on touch to reappear elsewhere. We must not overlook the action of Hep. sulph. in suppurative inflammations. A great difference of opinion prevails among several authorities on this point.Dr. Farrington says : -"If you give it in high potency when the throbbing, stabbing pains in the affected part and the general rigor show the onset of inflammation, it may abort the whole trouble. In other cases if you see that suppuration is necessary, and wish to hasten the process, then you give Hepar low." Drs. Allen and Norton seem to think in the same way.There are others again like Drs. Clarke and Nash that differ.We are also inclined to believe that the "indicated medicine" works with nature and promotes either absorption or suppuration as the vitality demands.Dr. Nash makes mention of a case in which the cm. potency of this remedy brought about "the most rapid pointing, opening and perfect healing." Dr. Clarke mentions another case of "an axillary abscess with a large collection of pus" in which Hepar 6 induced the most striking absorption. In my practice I have found that and believe DrNash and Dr Clarke's line of thinking. There are two other remedies with marked influence over the suppurative process, such as Sil. and Merc. and we want to discuss their applications. In Silicea the pus is thin, bloody, ichorous where-as in Hepar it is rich, thick and creamy; both have aggravation from cold and relief from warmth and hot applications. In Merc. the aggravation is pre-eminently at night.Its also a prominent remedy for gingival or gum abscess treatment and carries of teeth. This is an excellent post. I suffer from a chronic condition called Hidradenitis suppurativa and the abscesses I get are too painful to express in words. I am so glad that I discovered homeopathy after suffering for 12 long years. Silicea and hepar sulph are giving me wonderful results during acute outbreaks. Thanks for educating people. I have two screws in my tibia and one screw in my femur. they were originally put in during my anterior cruciate ligament reconstruction in 2003. Now fours doctors are of the opinion that the graft has lost its integrity and and re-torn due to traumatic re injury ( high repetition squats) and need to go for revision acl surgery. I just want those screws out of my bones and I'll think of the surgery on a later date. Would homeopathic silicea help i ejecting those screws? What potency should i take. How about hepar sulph... Should I combine them both..... should I have silcea 3x, 6x, 12 x, or something higher and for what duration. In the event those screws come out I would have to go for surgery to fully remove those screws, right? As you have mentioned that the screws are put during the process of surgery, it can only be removed by the same process. Homeopathic medicine works in natural cases.. 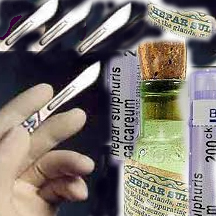 If you have a splinter stuck in.. then Hepar or Silicea helps. Those screw are screwed to the bone and will not respond to these said medicines..
Could hepar sulph help lung condition slicosis?